Police officers Riggs and Murtaugh team together for the third time. This time they must track down a guy who has robbed weapons from the Los Angeles police depot. 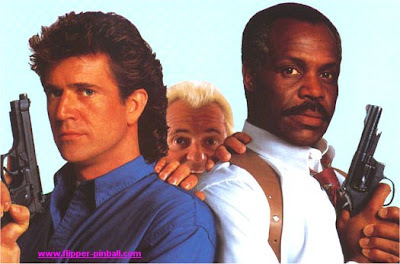 Riggs and Murtaugh also have to deal with Leo Getz, the hectic guy from Lethal Weapon 2 and Riggs has very special problems with a young and beautiful female police officer. Los Angeles police sergeant Roger Murtaugh and his partner, Sergeant Martin Riggs, arrest Billy Phelps for trying to rob an armored truck, this being just 8 days until Murtaugh is scheduled to retire. In the interrogation room, Billy is murdered by Lieutenant Jack Edward Travis, a vicious former cop who now sells guns that are stolen from evidence storage facilities. The investigation of Travis teams Riggs and Murtaugh up with Sergeant Lorna Cole of the Internal Affairs Division. Leo Getz, who is now a legitimate real estate agent, gets involved when he sees Travis's face on a paused videotape then says he recognizes Travis. Riggs finds himself falling in love with Lorna. Later, in a shootout against a street gang, Murtaugh kills a gangster who turns out to be Darrell Smithers, the best friend of Murtaugh's son Nick. A guilt ridden Murtaugh later tries to drink himself to death, but Riggs helps him realize that they must go after Travis, the man that Darrell's gun came from. Riggs and Murtaugh are back. This time after another one of Riggs' goofs, they are busted down to patrolmen. But they come across a robbery and they catch one of the robbers and discover that he has in his possession armor piercing bullets. Which means that no cop is safe. They go and try to speak to the man but Lorna Cole, a cop from Internal Affairs also wants to speak to him but Riggs is obstinate, so they go to the Captain, who not only backs them up but reinstates them as detectives. But when they go to see him, they find the man dead. But the learn who the killer is, a former cop named Jack Travis. But when they learn about this Cole shuts them out. But they get a lead from Leo Getz but unfortunately he gets away. Later Murtaugh shoots a boy who is armed with an automatic weapon and becomes despondent. Riggs is confronted by Cole who tells him that she should have been informed of the lead he had on Travis. Riggs then counters that she should tell him what is going on. She then tells him and they go out to try and find Travis.